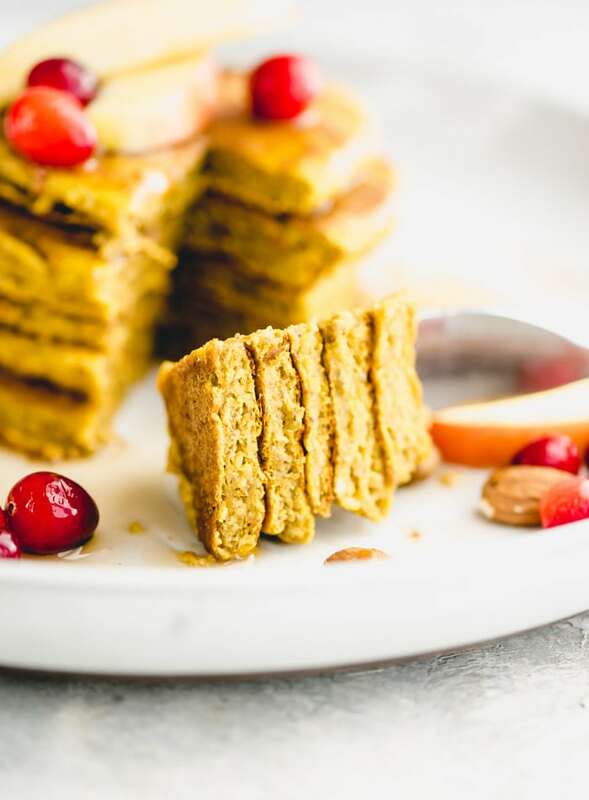 These gluten-free vegan pumpkin pancakes call for just 3 ingredients plus sweetener, baking powder and sea salt. They’re so easy to make! They’re also nice and fluffy, taste amazing and just perfect for Fall mornings. 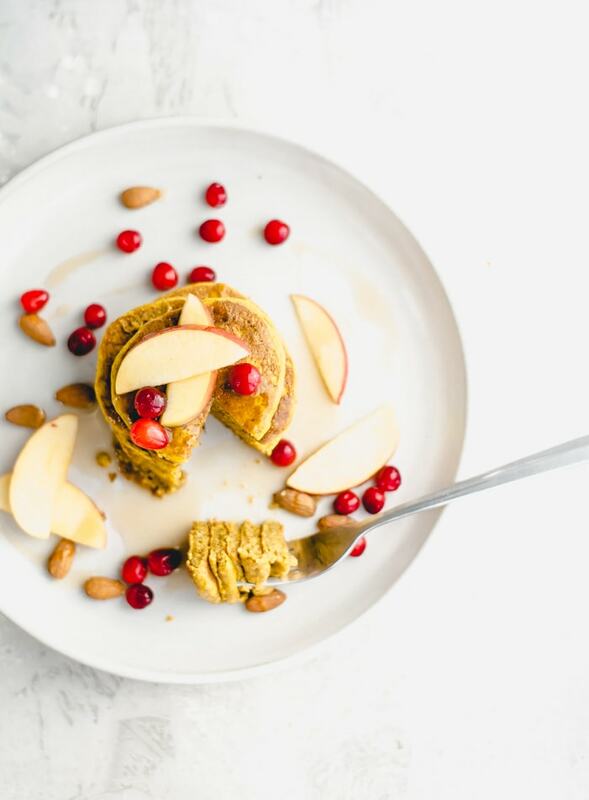 In addition to being vegan and gluten-free, this recipe is sugar-free, oil-free and high in protein and fibre. I used chickpea flour to make these but I’ve also tested them with brown rice flour and quinoa flour with success. Chickpea flour is my favourite for it’s nutritional profile but quinoa and brown rice flour both have their fair share of health benefits. If you want to use brown rice flour or quinoa flour simply replace them 1:1 for the chickpea flour. 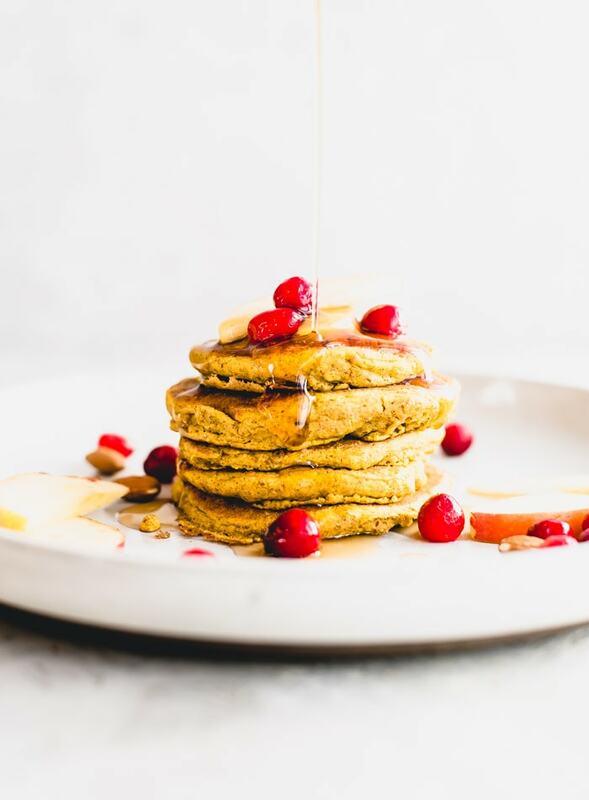 Check out my gluten-free vegan spinach pancakes to read more about chickpea flour. 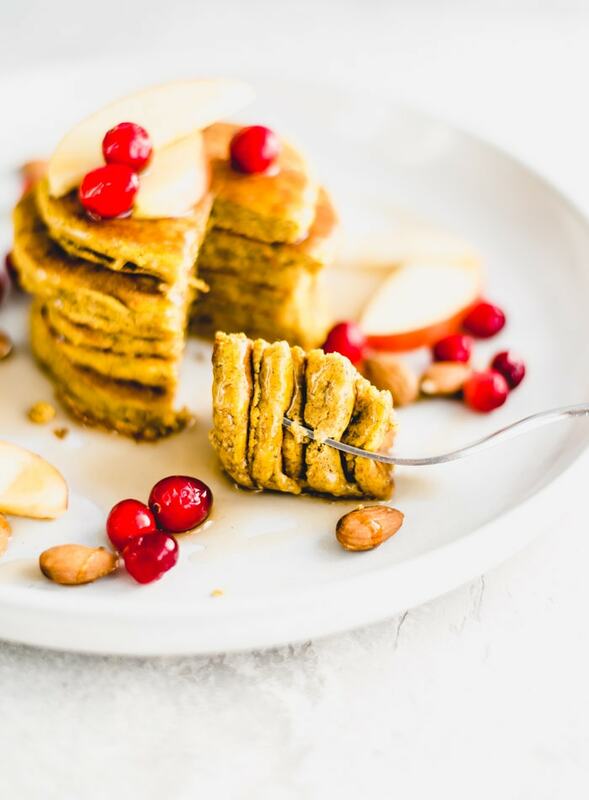 I also have a quinoa flour pancake recipe you can try for another gluten-free pancake option. 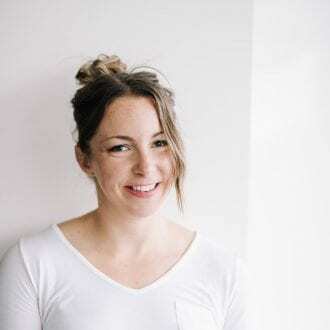 You can also check out my guide to whole grains for more info on other whole grain flours such as spelt and buckwheat. Chickpea flour, sometimes called besan or gram flour, does have a distinct beany flavour. You can really taste it if you sample the uncooked batter. I don’t mind it but some people don’t like it. Once the pancakes are cooked the chickpea flour flavour is very faint. Just be aware that the raw pancake batter won’t taste like a wheat flour-based batter. Chickpea flour. I love chickpea flour for pancakes. It’s so easy to work with, comes out nice and fluffy and adds protein and fibre. Baking powder. Baking powder helps these rise and get nice and fluffy. I wouldn’t suggest leaving it out. Sea salt. Sea salt adds flavour and works with the baking powder to create fluff. Use a good quality sea salt such as Himilayan pink salt or grey sea salt. Ground flax. I used 1 tbsp of ground flaxseed to add a little extra structute to these since they have extra moisture from the pumpkin. Sweetener. I used 1 tsp of unprocessed raw stevia leave to sweeten this recipe. Unprocessed stevia should be green in colour and a little courser than processed stevia. Other sweetening options include 1-2 tbsp of pure maple syrup, raw cane sugar, liquid stevia drops or coconut sugar. Pumpkin puree. I used Farmer’s Market Organic Pure Pumpkin in this recipe, which is my favourite canned pumpkin. Any canned pumpkin puree works or you can make your own from roasted pumpkin. If you’re using canned pumpkin, make sure it’s pure pumpkin and not pumpkin pie filling. Cinnamon or pumpkin pie spice. This is optional but I added a little pumpkin pie spice to add more pumpkin goodness. If you don’t have pumpkin pie spice, try adding 1/2 tsp of cinnamon and a small pinch of ginger and nutmeg. Mix the dry ingredients together thoroughly before mixing in the wet ingredients. This will ensure that the ground flax, baking powder and salt an evenly distributed. Pre-heat the pan over medium-high heat. The pancake batter should sizzle when you add it to the pan. Don’t over mix the batter. 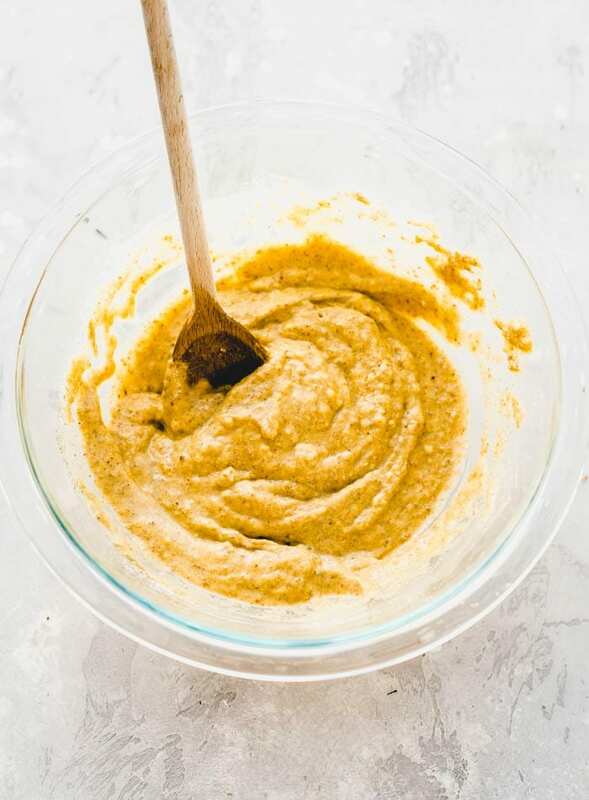 Once you add the pumpkin and water to the dry ingredients, gently fold them in until the batter is just mixed. Use non-stick cooking spray or a good non-stick pan. I used a quick spray of avocado oil cooking spray to prevent sticking. Don’t wing the water. I tested these with more and less water than the final recipe. 1/4 cup plus 2 tbsp is the perfect amount. If you add to much the pancakes won’t be as fluffy and will be a little mushy. Better to err on the side of too little. The finished batter shouldn’t be pourable, you’ll have to use a spoon or scoop to add the batter to the pan. 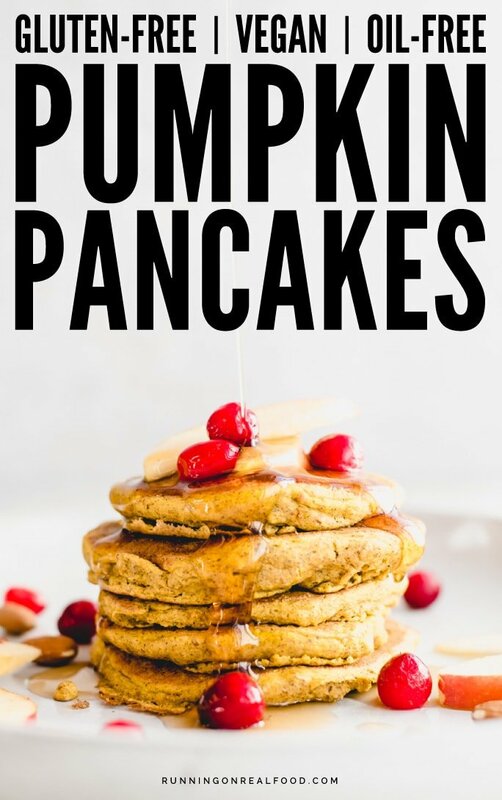 Just whisk those ingredients together until smooth and creamy and spread over your pumpkin pancakes. Try that with some almond butter and maple syrup for a special weekend treat. If you want to get really crazy add some cinnamon sauteed apples and crushed walnuts. This recipe serves one and provides 300 calories with 45 grams of carbohydrates, 6 grams of fat and 16 grams of protein. You’ll also be getting 11 grams of dietary fibre, half of your daily vitamin A (beta-carotene) and 30% of your daily iron. This recipe is also a good source of vitamin E, magnesium, potassium, folate, vitamin B6 and manganese. The flax is also source of omega-3 essential fatty acids, of which I talked about the importance of in my post on anti-inflammatory living. You can read more about plant-based nutrition in my vegan nutrition guide. 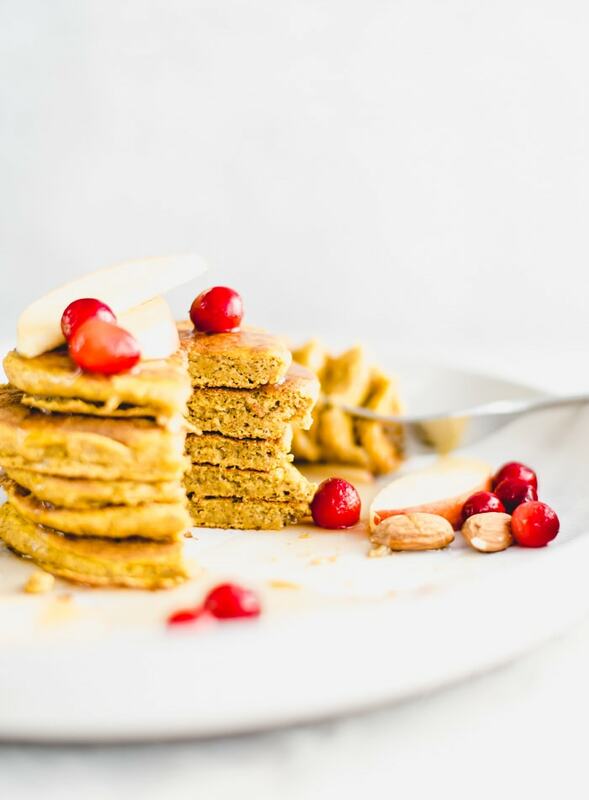 These pumpkin pancakes are so easy to make. You only need a few ingredients and about 10 minutes. Whisk up the batter, cook ’em up and enjoy! 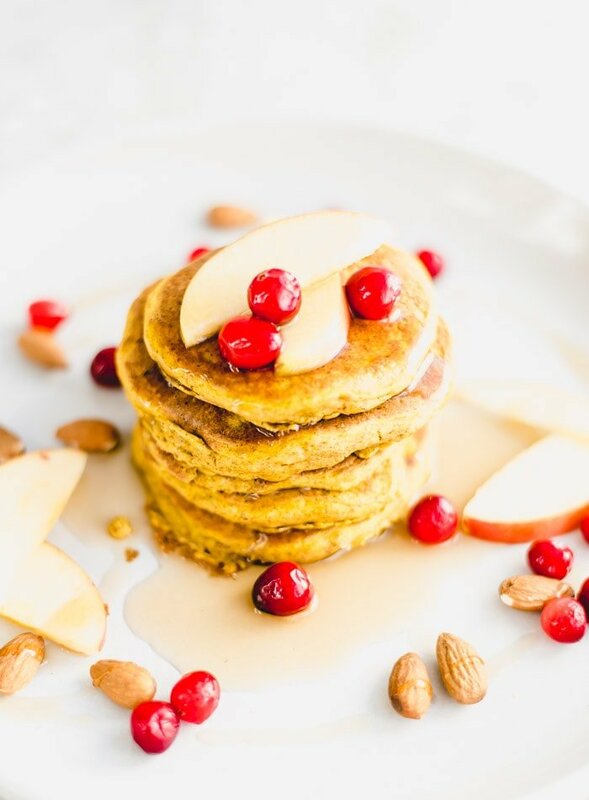 Try these topped with favourites such as almond butter, walnuts, coconut, pure maple syrup and date caramel. Add the water and pumpkin and fold everything together until all the flour is incorporated. It should be smooth and combined but not over-mixed. Heat a non-stick frying pan over medium-high heat. Don’t start cooking until it’s fully heated. Spray with non-stick cooking spray if needed. Scoop the batter onto the pan to form 5 pancakes. Cook until they look cooked, firm and dry around the edges, approximately 4 minutes, flip and cook for 1-2 more minutes. Yes, it’s so good! I totally forgot to put it in the pictures..haha..but I ate it with the afterwards and it’s the best. Made these for dinner tonight and loved them! I’m a big fan of oat pancakes, but I am totally onboard with these now too and I think they have a fluffier, more genuine pancake consistency. Just the right amount of pumpkin flavor, too…my husband liked them too until I told him they were made with chickpea flour and then he was super weirded out hah. So maybe I just shouldn’t have said anything…Thanks for the great recipe! hahaha, sometimes it’s best to keep our kitchen tricks a secret! I’m so glad you enjoyed them! I’ve never had much success with oat pancakes…I need to experiment a bit more. So glad you liked them. Thanks for the feedback and rating, appreciate it!